The Strategic 1 v 1 template is one of the built-in templates to Warzone. This template attempts to produce the best settings for a two-player heads-up duel. These are the same settings used by the 1 v 1 Ladder and the two 1 v 1 auto-games. This template uses the Random Warlords distribution option, which means that the territories available for distribution will be different for each game. Further, the use of wastelands ensures that the map is sufficiently randomized that a one-size-fits-all strategy is not possible. 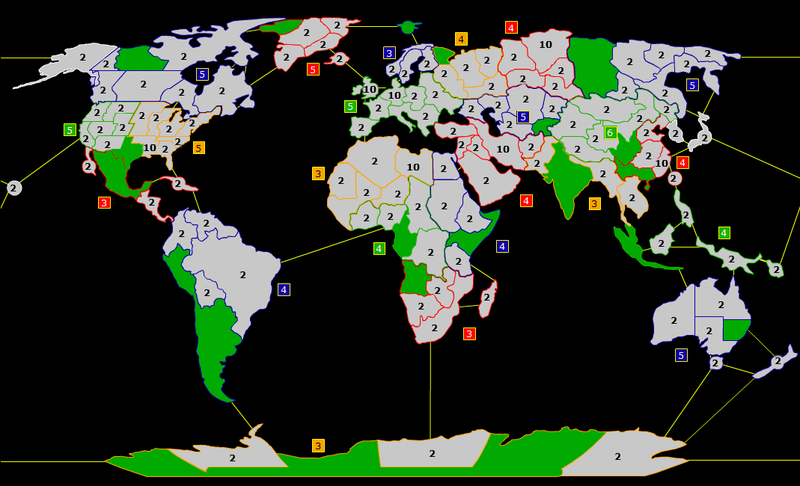 In this setup, note that the green territories (one per bonus) are the ones available for starting. Each neutral starts with 2, except for the wastelands which start with 10. Further, any green territories that neither player starts in will be replaced by a 4 - these are called cities. You'll want to pick 6 territories. Picking beyond 6 doesn't do anything, and picking fewer than 6 could cause you to get random territories, which usually ends up bad. Try to get your first bonus as quickly as possible. While the big +5 bonuses may look tempting, you'll be better off if you can take a smaller bonus faster and then use its income to take bigger ones. Don't attack wastelands. Expanding as efficiently as possible is key, and spending armies on wastelands that could be spent elsewhere is inefficient. Don't start in a bonus that has a wasteland. The bonuses you start in will be the cheapest to take, so by starting in a bonus with a wasteland you're removing that efficiency. Although your early bonuses can be taken faster when picks are close to each other, it is usually recommended to keep your options open and try start in bonuses which lie pretty far from each other. This helps ensure that you can expand safely somewhere far from early battles as much as possible. These games use Straight Round, which means that 2v1s and 3v2s, 5v3s, and 6v4s are guaranteed wins. New players sometimes think they need to attack 1s with 3s or 2s with 5s just to be sure they win, but this isn't necessary with Straight Round. Always take at least one easy bonus that is somewhat protected (two or more turns away from the enemy). You assume that your opponent will want the same spot, so pick it as your first pick. Your second and third picks could be a balance between: easy bonuses, territories that will prevent your opponent to get a bonus that you expect him to choose. Through your picks, you can figure out where your opponent is. It matters to stop one minute at the beginning and come up with a strategy to get the combat going in your opponent's border, not yours. It is worth picking two warlords that are so close together that you can get a bonus in the first round. That happens in Africa and Asia, mostly. The only problem is that it might make you vulnerable, if your opponent expects you to choose that strategy. Although 3 close picks can speed up your expansion, especially when surrounding a 5-land bonus which can be completed on turn 1, it's a very risky strategy: facing a nearby counter-pick will break your unity in the area and you won't have any other option to expand safely. Moreover, if you get 2 out of 3, most often your 2 close picks won't combine easily to gain unquestioned control of the area, that is, if the opponent can just stay alive against your 2 seeds. Try to figure out as fast as possible your opponent's income. That information will allow you to choose between an offensive or defensive strategy. Most of the time, it is worth growing - either slowly or quickly - even if you are fighting your opponent. It increases your income and gives you cards. This page has been accessed 64,893 times.